Learn how to backpack with our small group, women only backpacking workshop in the Red River Gorge. It’s a hands-on, overnight experience taking place on the weekend! Have you ever dreamed of hiking to a faraway, remote land to spend a few days camping and living in the wild surrounded by mountains? We have! And, we want you to be able to live freely in the wild at your every whim armed with the skills and experience to do so! 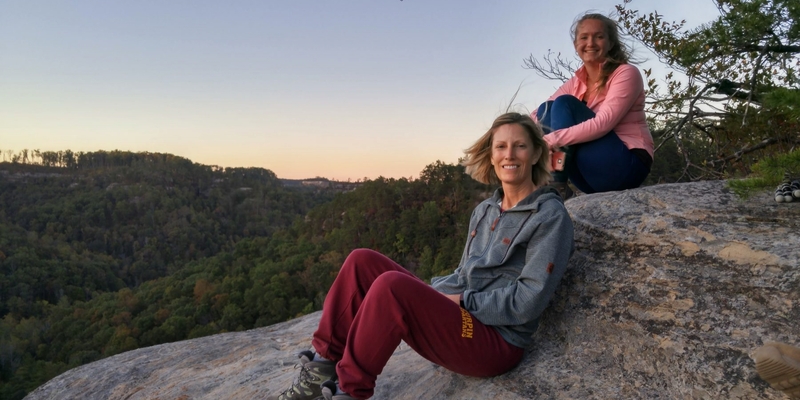 With the Red’s abundance of natural bridges, sandstone cliffs, rock shelters, and arches, we couldn’t think of a more beautiful location to teach you how to backpack in the wilderness. The best part? We’ll lend you the essential Gear to get started! 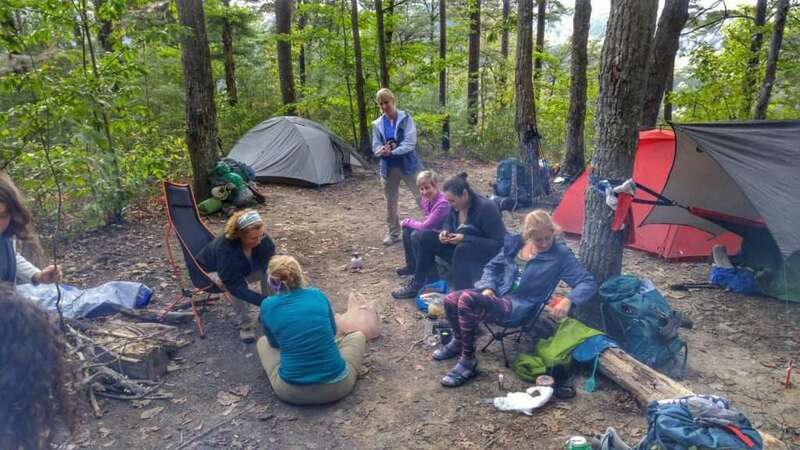 Every Explorer Chick will be provided with a Backpack, a Sleeping Bag, a Sleeping Pad, and a shared 2 person tent. We’ll provide all of the meals beginning with Saturday lunch through our Sunday closing lunch at a Red River Gorge local eatery. As for the rest of the gear, you’ll be provided with a packing list. 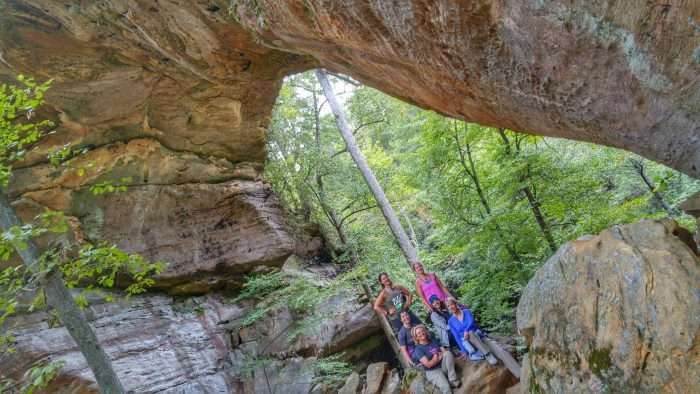 Explore the many Arches, Sandstone cliffs, Natural Bridges, and Rock Shelters in the Red River Gorge. 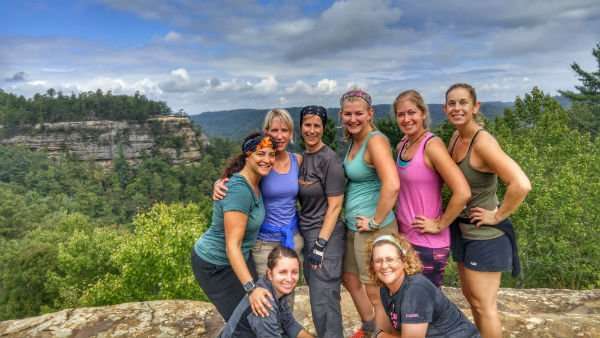 Receive a hands-on experience with a small group of women guided by the Explorer Chick experts. You’ll be able to ask all of your questions, practice your skills as often as necessary, and get personal attention without feeling awkward or embarrassed! 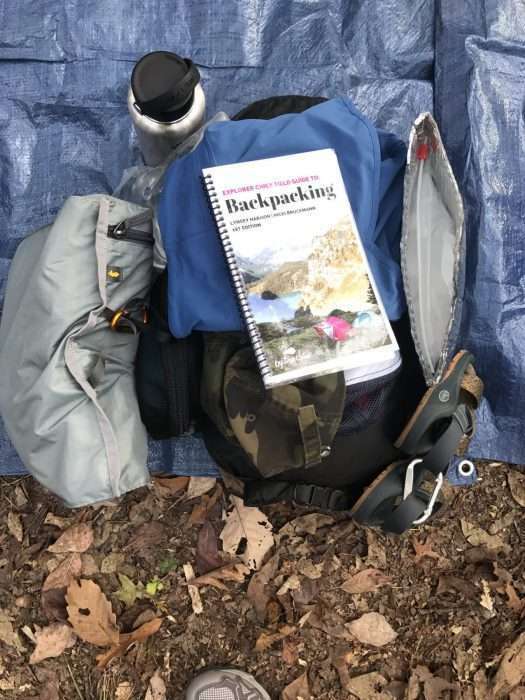 Borrow the expensive gear giving you the opportunity to learn all about Backpacking and the required gear before investing in your own! 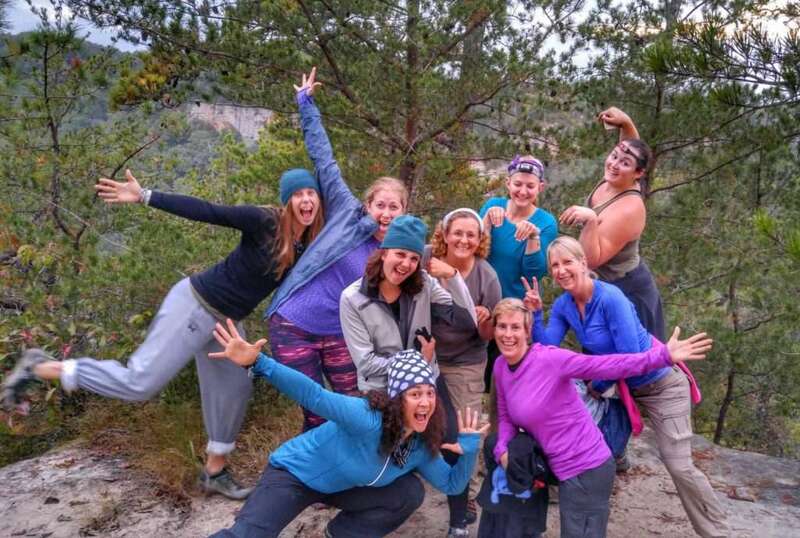 Spend two days meeting and becoming friends with a fabulous group of outdoor adventure lovin’ women! 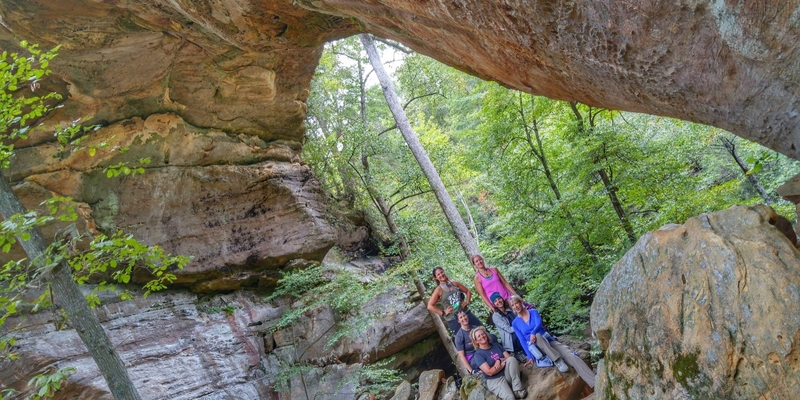 End your Outdoor Adventure with our closing lunch at a local Red River Gorge eatery. Go home with a full belly and a happy heart! 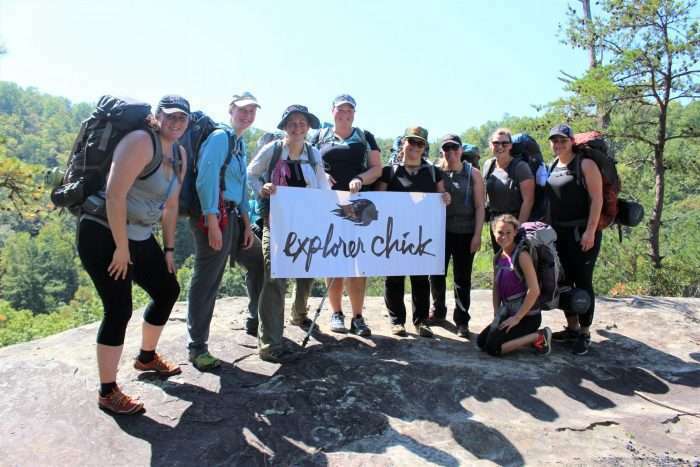 Hands-on, guided experience from an Explorer Chick expert. You’ll learn everything from correctly packing your backpack, hanging a bear bag, setting up camp, backcountry cooking, Leave No Trace, and much more. *You will receive a mandatory packing list when you book your workshop which will include personal clothing, trail shoes, a headlamp, rain gear, and more. 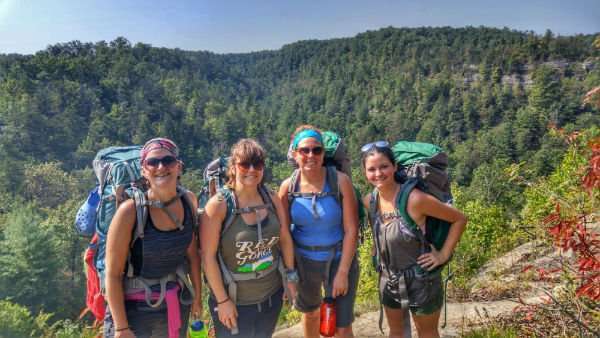 *Packages do NOT include your airfare, airport transportation, transportation to the Red River Gorge, alcoholic beverages, Explorer Chick Leader tips, or costs for additional activities. 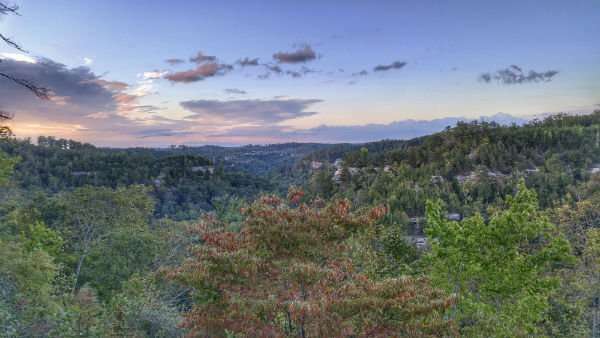 Located on the Daniel Boone National Forest under the special use permit from the Forest Service, USDA. We require a minimum of 3 Explorer Chicks for this trip. Please confirm your trip is guaranteed. 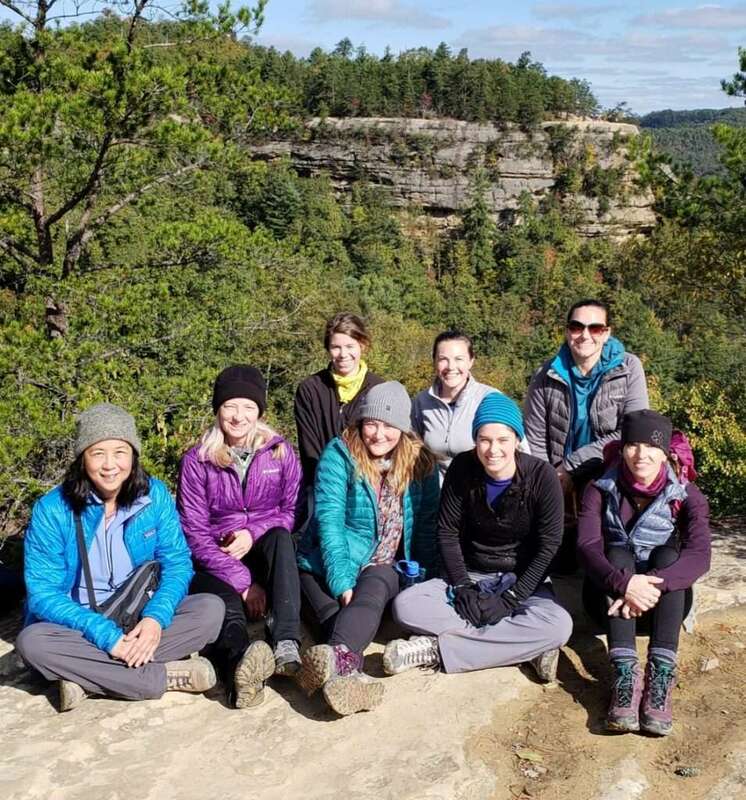 Explorer Chicks are responsible for their own transportation to/from the Red River Gorge. Plan to arrive at the designated Trail Head early Saturday morning and depart the Red River Gorge late afternoon Sunday. 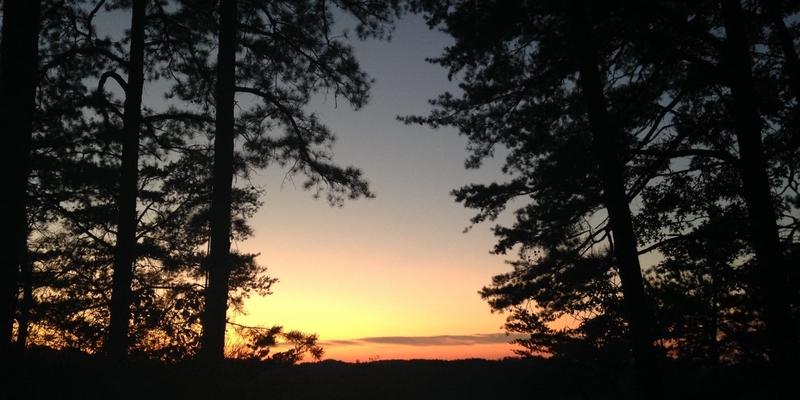 You will receive the trail head location and directions in your Travel Guide upon booking. 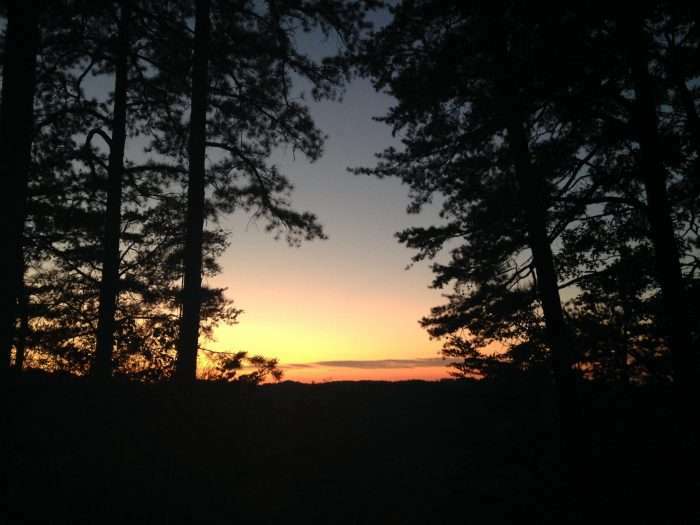 You will be responsible for traveling from the Trail Head to the Optional day hike and closing lunch on Sunday. 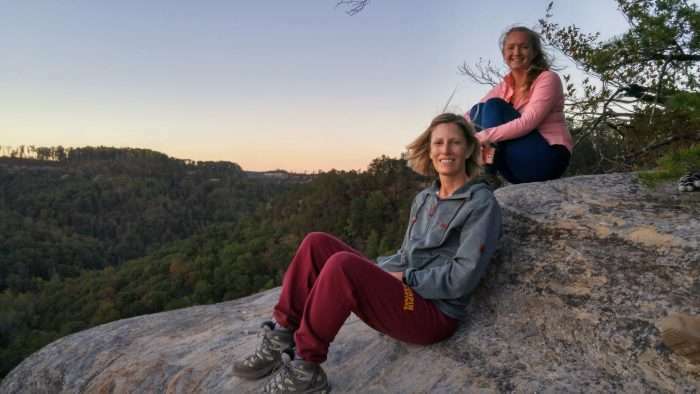 Both are located in the Red River Gorge vicinity. 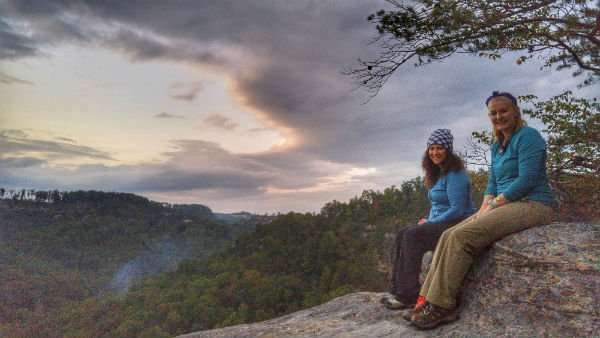 There are several hotels in the area for an overnight stay in Red River Gorge. 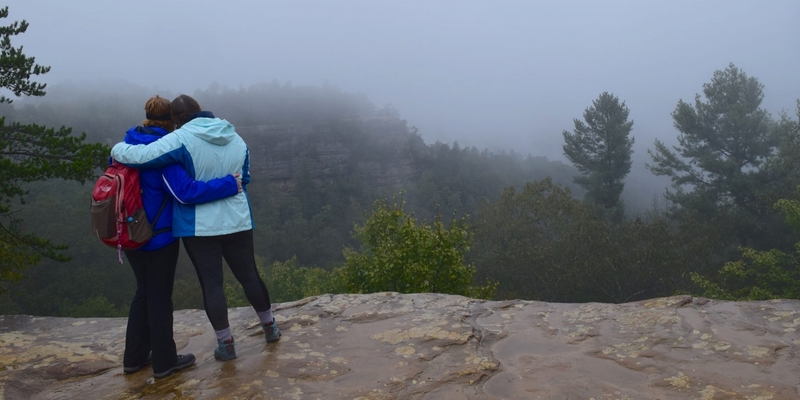 If you are flying, Lexington is the closest airport with an approximate 1 hour drive to the Red River Gorge. 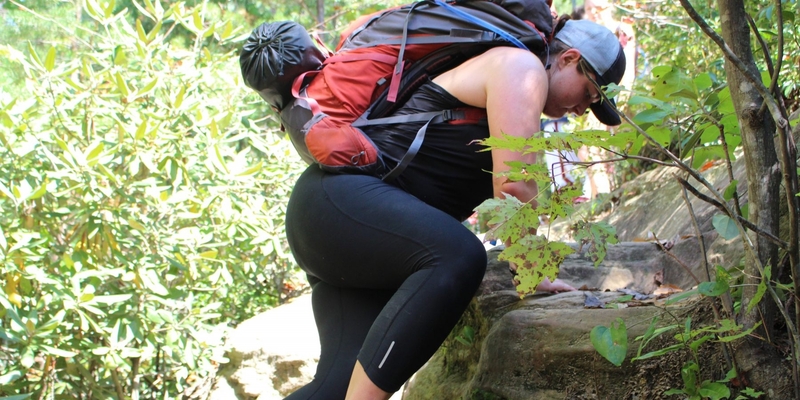 Backpacking differs greatly from casual day hiking and trail running in local parks. 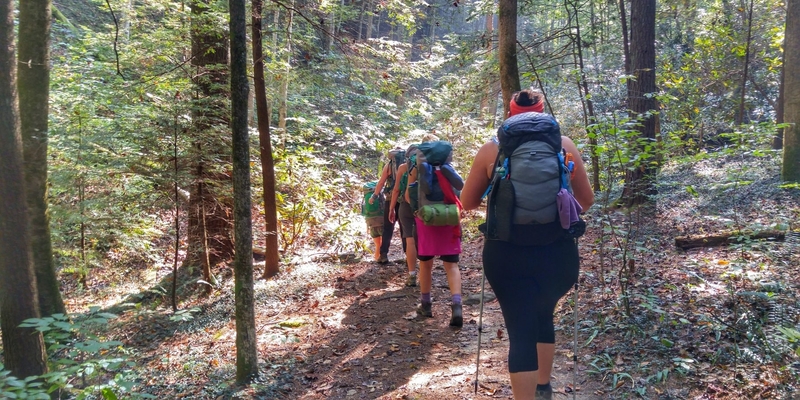 We want all Explorer Chicks to enjoy their backpacking experience which is why we find it crucial to set realistic expectations for this workshop. 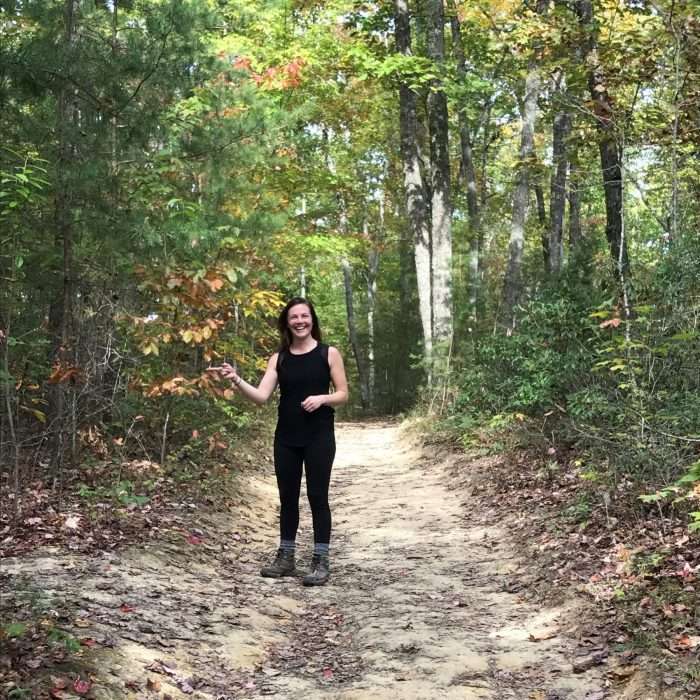 We will hike a loop that is just over 6 miles round trip with our backpacks setting up camp approximately 4 miles into our hike. 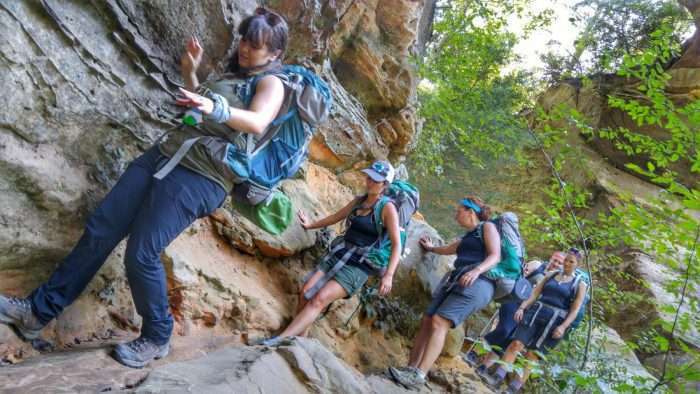 What makes the Red River Gorge absolutely breathtaking also makes it’s trails steep and strenuous at times. It is a gorge after all! 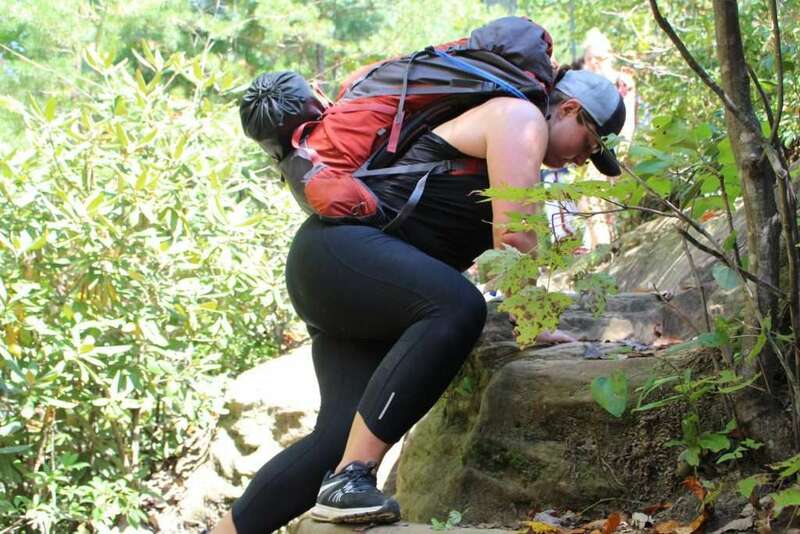 You will be hiking some steep sections with a backpack. Expect to carry approximately 25 pounds on your back. 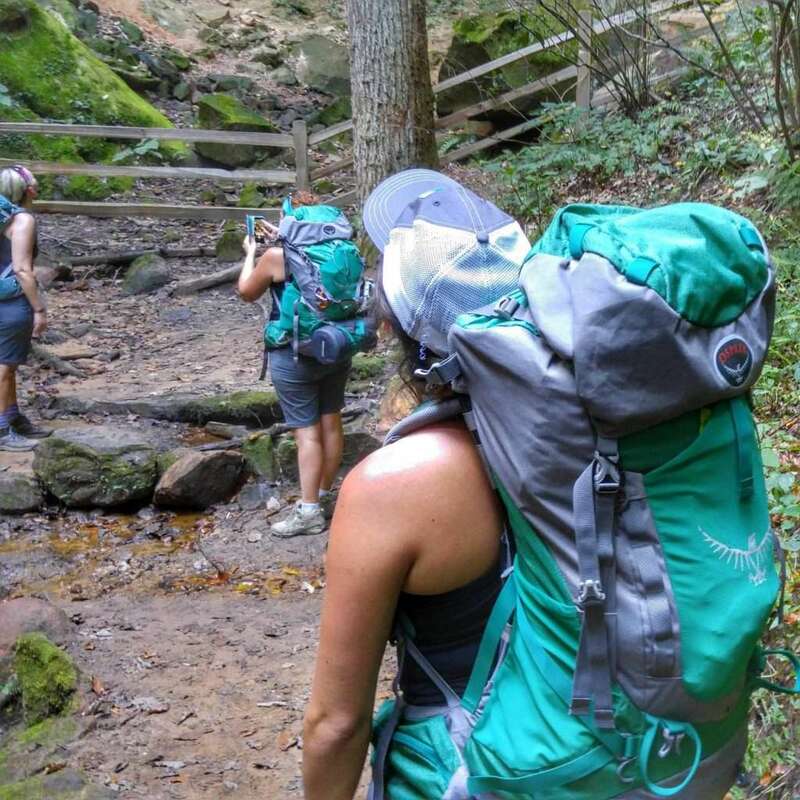 You will be responsible for carrying your own pack, assigned gear, and necessities. 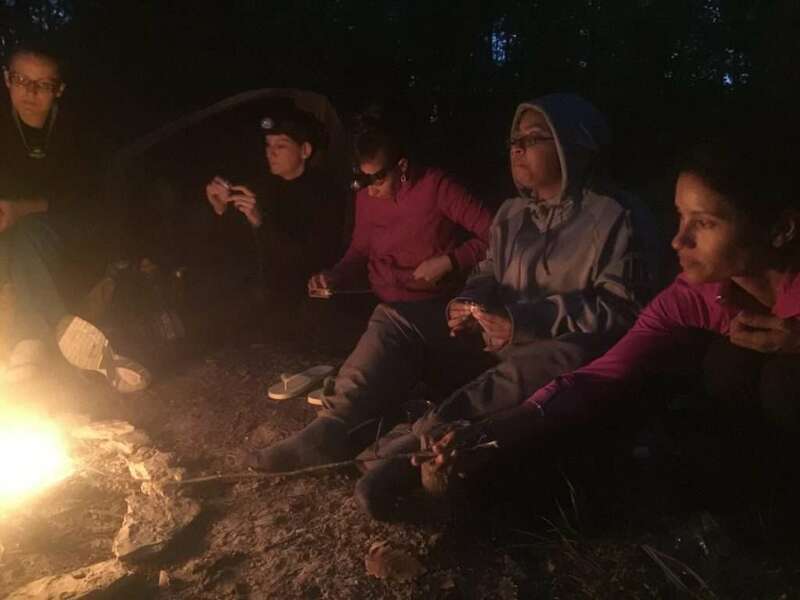 When planning the route, we take into consideration the variety of skill and abilities of the women joining us on the adventure allowing ample time to reach camp and to instruct. 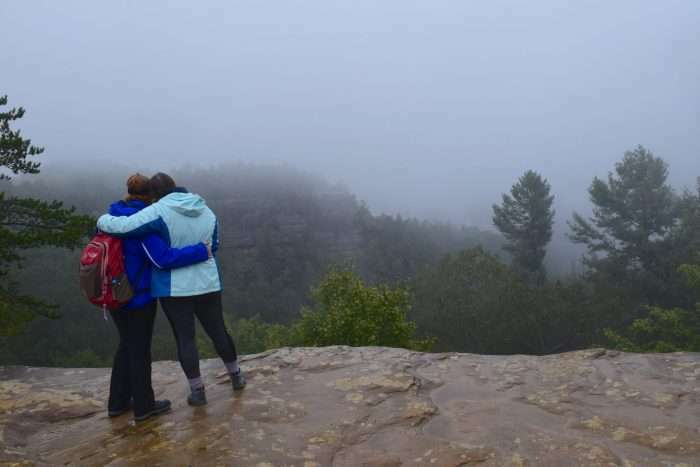 Keep in mind we will hike together as a group. 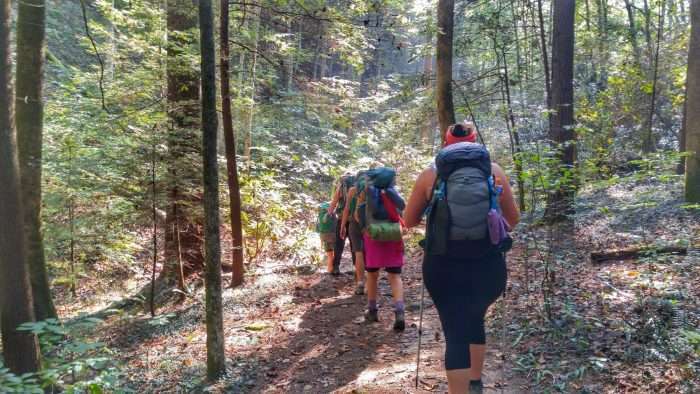 The pace of the trip will vary based on the group’s overall abilities. Save $20 with Early Bird Pricing! I’ve traveled with Explorer Chick and attended local ‘mini’ adventures! I’ve gone rock climbing, backpacking, zip lining, and done aerial silks. Every experience has been an awesome, positive adventure! 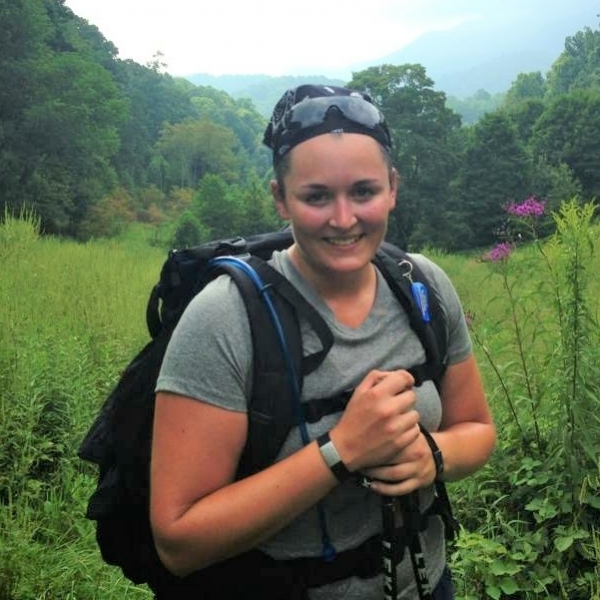 Nicki does an awesome job organizing the trips and is personable and knowledgeable! 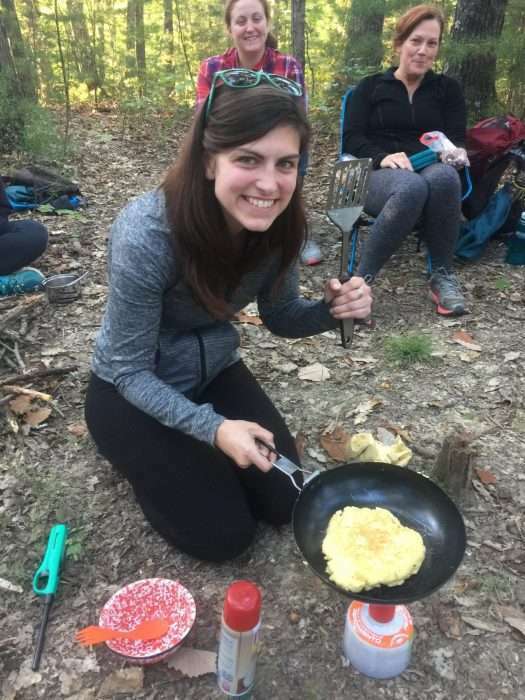 She had all the details worked out, especially on the backpacking workshop where we borrowed gear, and she provided all the food (except snacks). 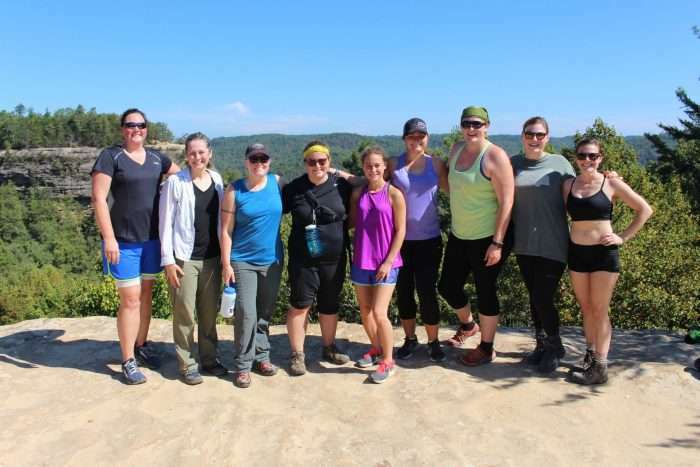 All the women I’ve met have been very cool and I highly recommend EC to any woman looking to try new things! 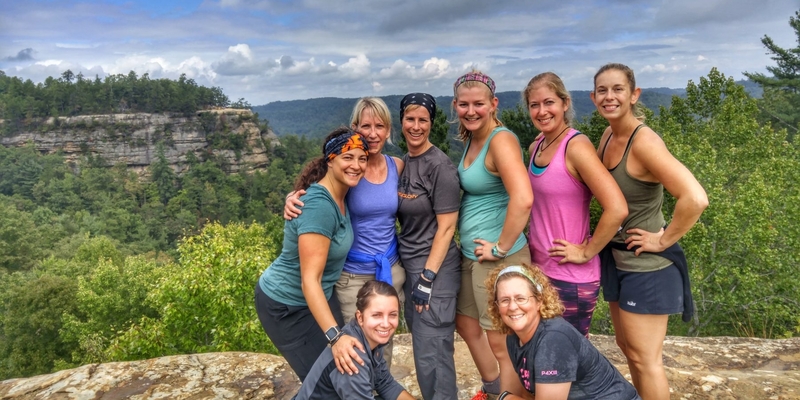 Explorer Chick Adventure put together a wonderful backpack trip at Red River Gorge. 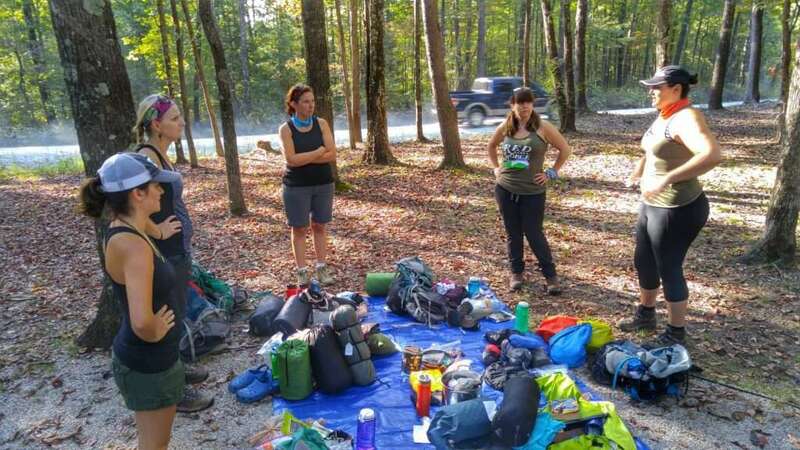 We had an awesome time, Nicki and Lynsey did such a great job organizing everything and teaching us the backpack basics. I can’t wait for the next trip!!! 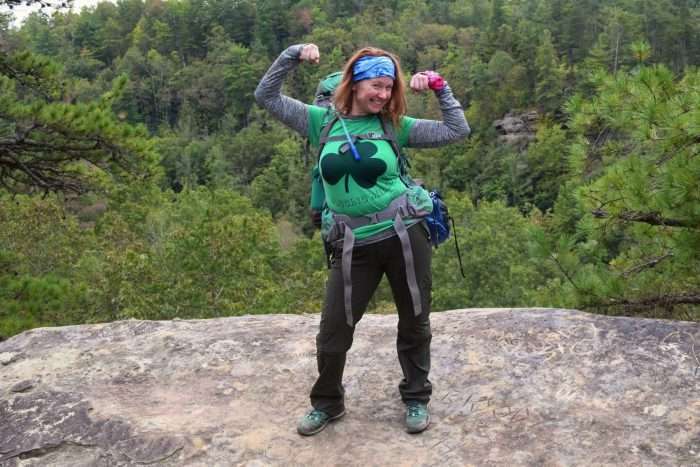 Hannah did an amazing job leading our Backpacking Basics trip in Red River Gorge. You want challenge? You want to learn? You want to have fun doing it? You’ll find it here! Our group was diverse in age, experience, occupation and city of origin, but were all so positive, funny and supportive. 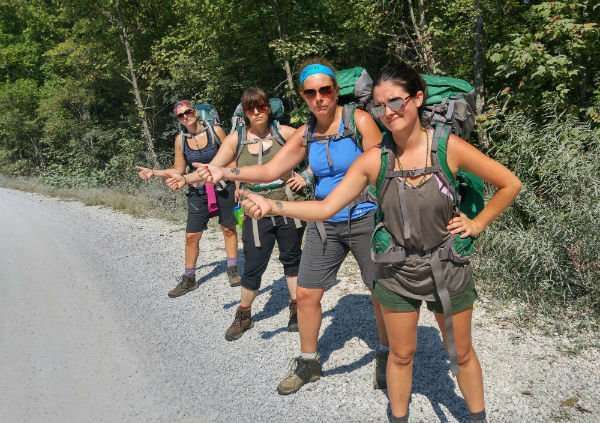 Because of that support, we persevered and overcame all the trail could throw our way, and we had an amazing time. 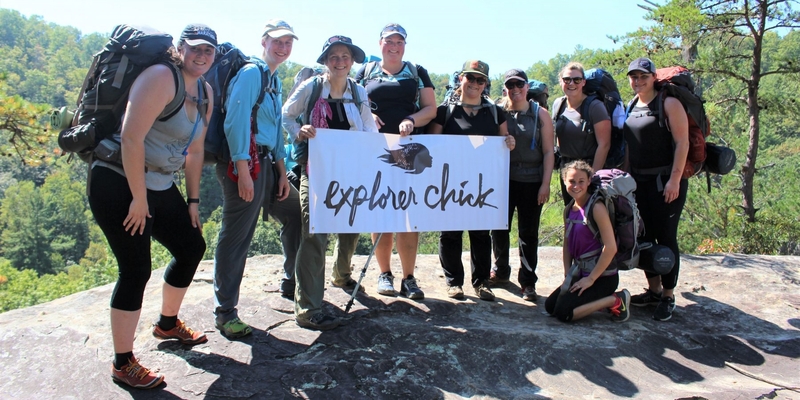 Go beyond what you ever thought you could- be an Explorer Chick! As soon as the Kentucky highway turned into Mountain Parkway, I knew this was going to be amazing. 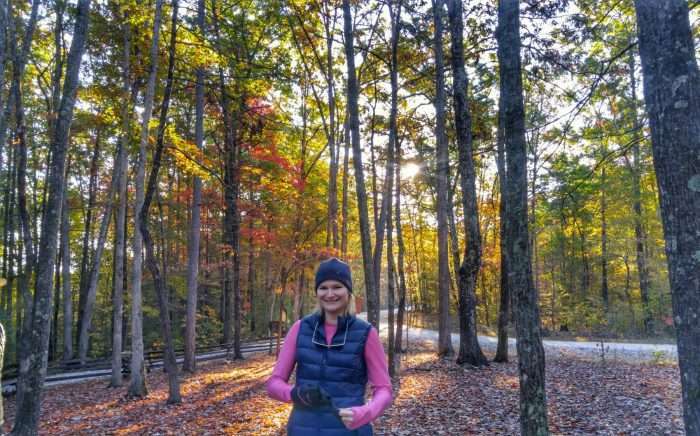 The ride up into the mountains eventually turns to a winding gravel road and a wooden state park sign welcomes you to Backcountry Camping~pure magic. 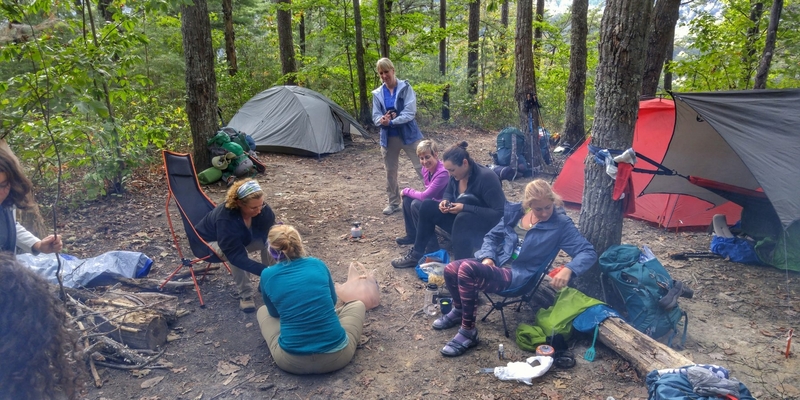 Our guide, Hannah, greeted us warmly with Explorer Chick swag , showed us how to minimize our pack, pack it properly and ensure a comfortable fit. 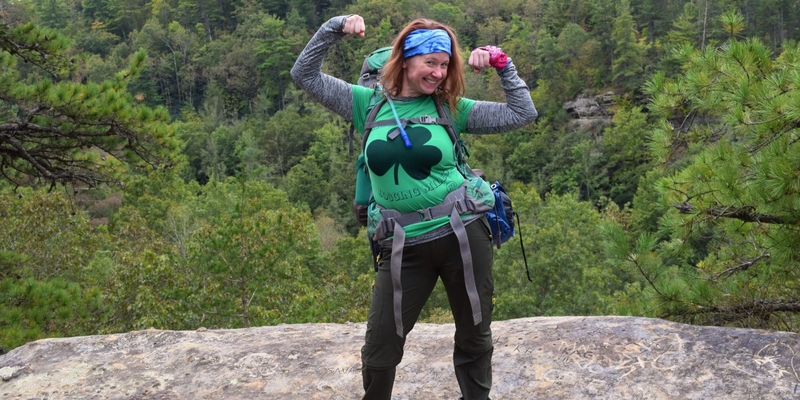 She was knowledgeable, patient, and supportive every step of the way and taught us So many valuable gear and trail tips. I can’t say enough about what a great opportunity this was, if you have Any interest in backpacking, take this workshop, there isn’t a better way to start out.